The need for clean, dry gases for use in aerospace test equipment led to the development of adsorptive systems. Introduced in the 1960s, Kahn adsorptive systems employ regenerative desiccants to remove moisture or contaminants from process gases or liquids. Adsorptive systems are used in a wide variety of chemical and manufacturing processes. 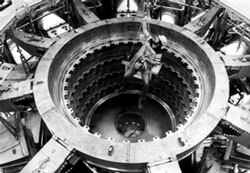 One of the more interesting applications of Kahn adsorptive technology is a reprocessing system for the insulating gas used in the world's most powerful particle accelerator at Sandia National Laboratories in Albuquerque, New Mexico. By removing contaminants, this reprocessing system saves time and money by enabling Sandia to use the same sulfur hexafluoride gas over and over. Particle Beam Accelerator at Sandia National Laboratories. A Kahn adsorptive system is in use to continuously purify sulfur hexafluoride (SF.) used as an insulating gas accelerator. The development of hydraulic dynamometers was another result of Kahn's involvement with aerospace test equipment. Operating like centrifugal pumps, hydraulic dynamometers use water as a medium for absorbing and measuring the power output of engines, turbines and electric motors. Kahn hydraulic dynamometers are now used in the aerospace, automotive and power generation industries for development, production and post-overhaul performance testing of a wide variety of prime movers. Interesting applications include a large dynamometer used for development and endurance testing of LM2500 marine gas turbines, which power the U.S. Navy's DD 963 class destroyers. Commissioned in 1971, this dynamometer was capable of absorbing 37,000 kW (50,000 hp) at speeds up to 4500 rpm. With a dry weight of over 36,000 kg (80,000 lb), it was the largest hydraulic dynamometer manufactured in the United States up to that time. In contrast to conventional hydraulic dynamometers, this unit was designed to provide virtually unlimited service life due to its cavitation-free smooth disc power elements. When it finally was replaced with a new and more powerful Kahn dynamometer after 20 years of continuous service, it had logged over 27,000 operating hours with its original power elements. Another notable application is a 7500 kW (10,000 hp) high-speed dynamometer used for development testing of the T406 turboshaft engine which is used as the power plant for the Osprey V22 tilt rotor aircraft. In order to simulate actual flight conditions, the engine and dynamometer are installed in a variable attitude test stand where they are operated throughout all attitude positions, from horizontal to vertical. Model 406-160 Hydraulic Dynamometer. 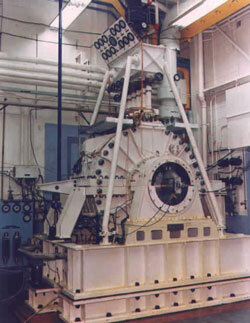 37,000 kW (50,000 hp) hydraulic dynamometer used for testing LM2500 marine gas turbines. It accumulated over 27,000 operating hours with its original power elements. To measure the moisture content of gases passing through its adsorptive systems, Kahn developed an electrolytic hygrometer in the early 1960's. Initially, these units were designed to measure the moisture level of compressed air used on the DEWLINE (Defense Early Warning Line) in northern Canada. Incorporating the latest technologies, this product line has been continuously expanded and today includes a wide range of moisture measurement instrumentation equipped with ceramic, aluminum oxide and chilled mirror optical moisture sensors. 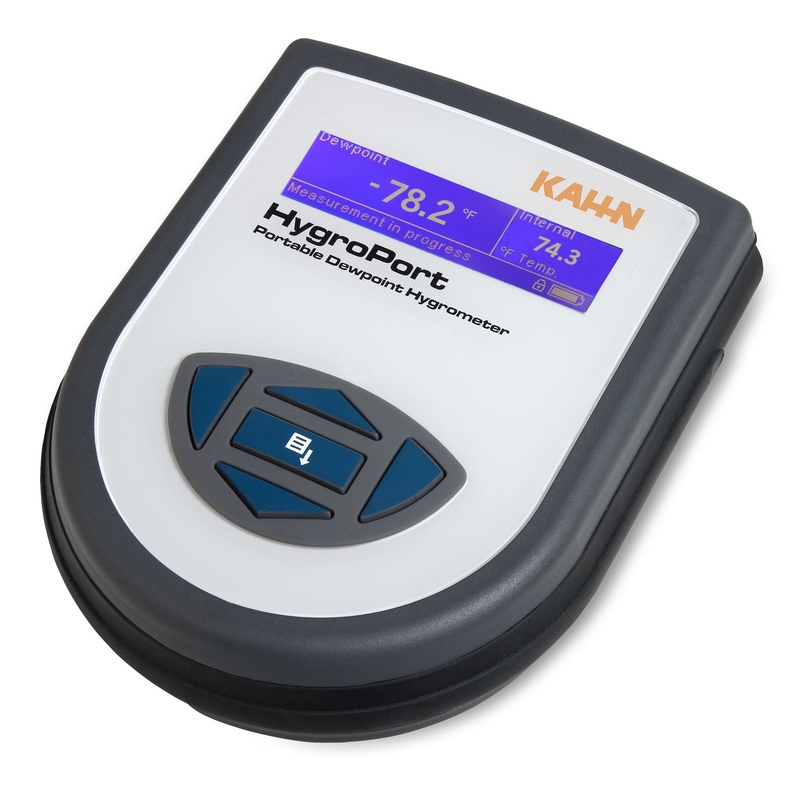 A common application for the Kahn portable hygrometer is remote monitoring of the water vapor content of natural gas pipelines. Water is an undesirable additive which can contaminate natural gas and corrode the pipeline. Kahn has supplied numerous moisture monitoring systems which operate by telemetry to relay dewpoint data to central stations. For the U.S. Navy, Kahn has provided portable hygrometers to measure the moisture content of dry nitrogen which serves as an insulating gas surrounding the optics on submarine periscopes. Low dewpoint coupled with little volume made this difficult application an interesting and ultimately successful challenge. HygroPort Portable Hygrometer. The HygroPort Portable Hygrometer is a lightweight, rugged battery-operated instrument intended for portable measurements of moisture in compressed air or other process gases.